Naturally occurring compounds that promote energy expenditure and delay aging in model organisms may be of significant interest, since these substances potentially provide pharmaceutical approaches to tackle obesity and promote healthy lifespan in humans. 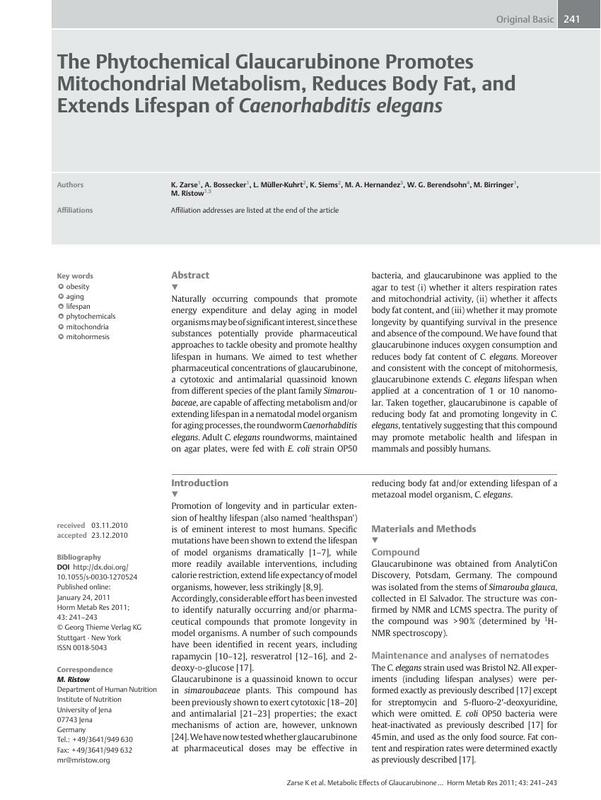 We aimed to test whether pharmaceutical concentrations of glaucarubinone, a cytotoxic and antimalarial quassinoid known from different species of the plant family Simaroubaceae, are capable of affecting metabolism and/or extending lifespan in a nematodal model organism for aging processes, the roundworm Caenorhabditis elegans. Adult C. elegans roundworms, maintained on agar plates, were fed with E. coli strain OP50 bacteria, and glaucarubinone was applied to the agar to test (i) whether it alters respiration rates and mitochondrial activity, (ii) whether it affects body fat content, and (iii) whether it may promote longevity by quantifying survival in the presence and absence of the compound. We have found that glaucarubinone induces oxygen consumption and reduces body fat content of C. elegans. Moreover and consistent with the concept of mitohormesis, glaucarubinone extends C. elegans lifespan when applied at a concentration of 1 or 10 nanomolar. Taken together, glaucarubinone is capable of reducing body fat and promoting longevity in C. elegans, tentatively suggesting that this compound may promote metabolic health and lifespan in mammals and possibly humans.